Ross Parish has been researching holy wells since the 1980s and has published several books on the subject. Ross is currently working on a Staffordshire volume and a couple of weeks back, we were delighted to have him at our Lichfield Discovered meeting to share his research with us. Ross took us through the history of holy wells, and some of the customs associated with them, pouring cold water on some of the popular views that have sprung up around them. At the risk of firing up inter-county rivalry, you’ve heard the saying ‘The best bits of Derbyshire are in Staffordshire’?. Well, Staffordshire is also a bit hard done by when it comes to the tradition of well dressing. Google it and you’ll find claims aplenty that it’s ‘unique to Derbyshire’. Try telling the people of Endon and Mayfield that. Interestingly, we also went through a phase of decorating St Chad’s well here in Lichfield for a time, but this tradition seems to have dried up in 2010. 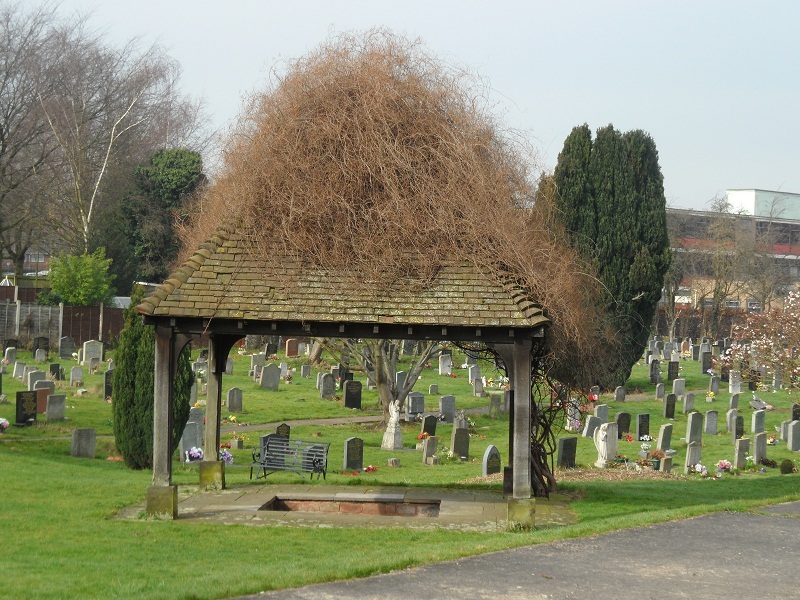 St Chad’s Well Lichfield, only decorated by nature these days. With so many fascinating sites to chose from, we forgave Ross for not including St Chad’s in his top ten list of Staffordshire wells. You can discover the ones that did make it, along with an abundance of other fascinating information, on the slides of the talk that Ross has very kindly shared with us online here. 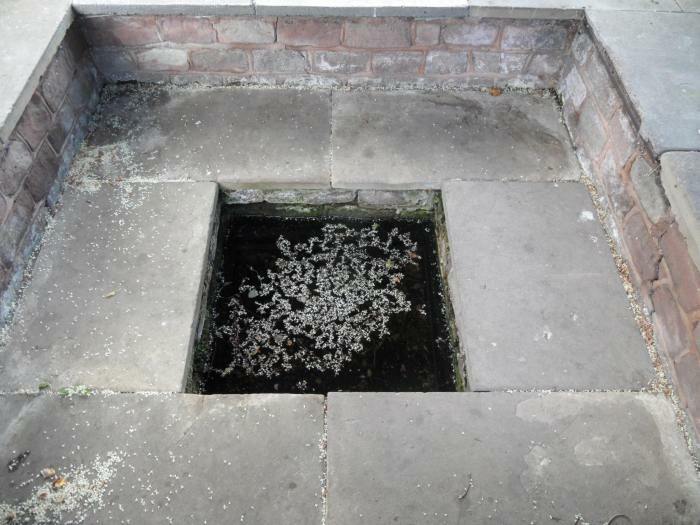 If you’ve a thirst to know more about holy wells and sacred springs, here in Staffordshire and further afield, please do check out Ross’ blog here and also take a look at the Facebook group he’s involved in here. Springs and wells are sources not only of water but also of folklore and legend. There are healing springs and fortune telling wells. Some are associated with saints, others with spirits. On Monday 9th February, Ross Parish, author of the Holy and Healing Wells blog and a series of books on the subject, will be giving a talk to our Lichfield Discovered group. Ross will be telling us about some of the sites we have here in Staffordshire and some of the traditions and stories associated with them. The talk starts at 7.30pm at St Mary’s in the Market Square (where there was a once a well of the same name at the west end!) and there is no entry charge, although voluntary donations towards the running of St Mary’s are always welcome. After the talk, people are invited to stay behind to discuss the future vision of the county’s archive and heritage service, over a cup of Staffordshire water (plus milk and teabag). I’m intrigued by this reference to ‘the ancient St Chad’s stone’. 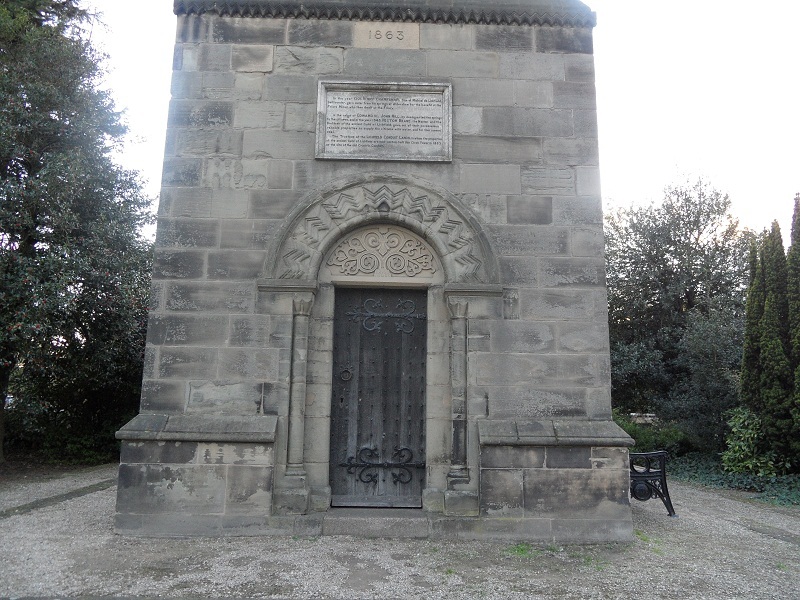 When James Rawson described the site prior to his restoration in the 1830s, he noted that, ‘the well-basin had become filled up with mud and filth; and on top of this impurity a stone had been placed, which was described as the identical stone on which Saint Chad used to kneel and pray!’. Despite Rawson’s apparent scepticism about these claims, was he somehow persuaded to use this stone in his new well structure, thereby perpetuating the myth? I’d love to see what went on in those discussions and I’d really like to know what happened to this legendary stone. St Chad may not have been anywhere near it, but the fact that people believed he had should have made it worth saving for posterity’s sake. 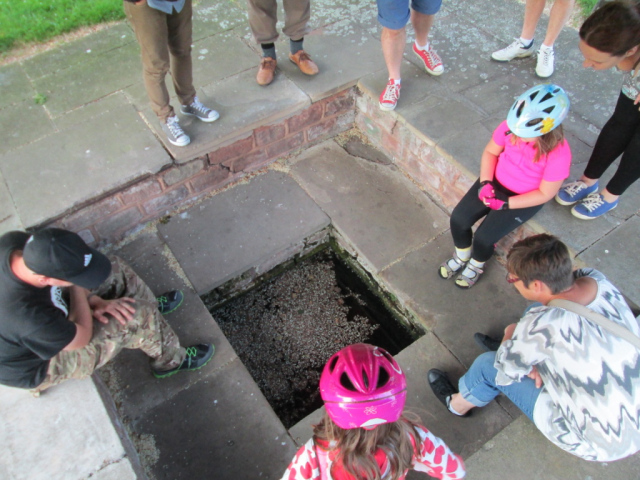 Unfortunately for Mr Sutton, the restoration of the well did not put a stop to people using St Chad’s Well for wishes, as evidenced by the layer of coins that still glint beneath the water, tossed in at some point over the last half century or so. It’s often suggested that this is the continuation of a ritual that our ancestors were carrying out a long, long time before St Chad arrived in Lichfield. Some things change. Some stay the same. (1) The octagonal stone well structure erected by Rawson in the 1830s, as described by the Lichfield Mercury on May 6th 1949! Our next Lichfield Discovered meeting is fast approaching (7pm on 10th March at Lichfield Heritage Centre) and this time round we’re having a bit of a show and tell. 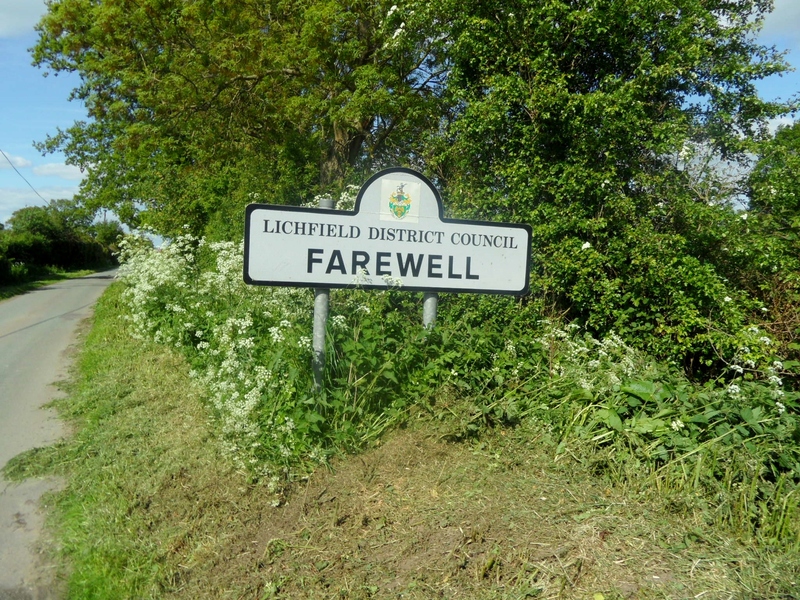 We’ll be having a go at telling one hundred years of Lichfield History in twelve objects and we want people to get involved by bringing along their Lichfield related objects to show us all. There are loads of objects that I’d love to be able to bring along with me, but can’t, either because they’re lost, immovable or I’d be arrested. So instead, over the next week or so, I’ll share some of them here instead. First up, the earthenware jars found in the south wall of Farewell Church during its partial demolition. St Bartholomew’s in Farewell was once the site of a Benedictine Nunnery. The place name refers to the ‘pure or clear’ spring which still flows here. The original church incorporated material from the nunnery, but much of it was demolished and rebuilt in brick in the 1740s. Trust me, there is a spring beneath here. In my opinion, it takes something pretty special to top an ancient spring, but here at Farewell, the most interesting thing for me is the discovery of three rows of different sized earthenware vessels in the south wall of the church at the time of the renovations. The jars were lying on their sides, their openings facing inside the church, covered with a thin coat of plaster. Sadly most were broken during the work but one of the jars found its way to Mr Greene’s Museum of Curiosities on Market St, Lichfield. Its whereabouts is now unknown but luckily, someone did make a woodcut engraving of it, as seen here on Staffordshire Past Track. The purpose of the jars remains a bit of a mystery. The accepted explanation is that they were ‘acoustic jars’, used, as the name suggests, to improve the acoustics in the church, based on a theory from a Roman architect called Vitruvius. However, others have suggested that they may be related to the idea of votive offerings (interesting article here). It’s a good example of how important is it to not to separate objects from their stories . Without knowing the context in which it was found, the jar becomes just another piece of pottery and without being able to examine the jar itself, the real reason why (and when) it was placed in a church wall in Farewell centuries ago may never be known. When Spring finally does arrive, do try and visit Farewell via Cross in Hand Lane, the old pilgrims route & former road to Stafford. It’s a lovely walk to a lovely place with the banks of the ancient holloways covered in flowers and the Ashmore Brook running alongside if you fancy a paddle. 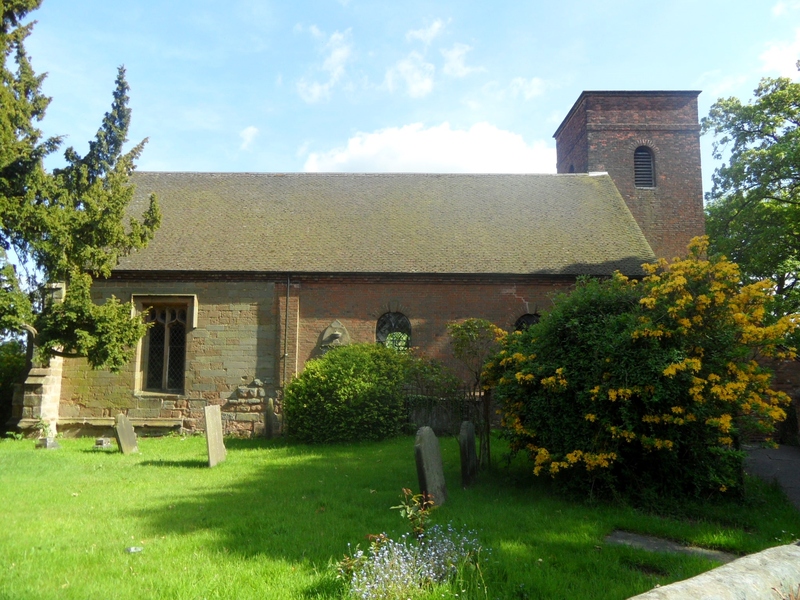 Still curious about the old church of St John the Baptist at Shenstone, I did a bit more reading. Inevitably, I’ve ended up even more curious than I was before. I am anxious to assure the Restoration Committee how fully I concur in the steps they have taken to preserve the old tower, for both on practical and sentimental ground it should be upheld. The appointment of Mr Bridgeman as restorer is the best your Committee could make, and I know he will thoughtfully and carefully carry out the work entrusted to him. The old tower so called is really not very ancient, except perhaps the internal base; the upper part boasts of no architectural feature of note, the details being of a debased character, and early in the present century there evidently existed a kind of central beacon flag-pole and vane combined. There were also diagonal shaped dials upon the tower. One other feature worthy of mention, and of which I fear no trace remains, was a stone hollowed out in the Romish times, for the reception of holy water. It formerly stood near the north door and over it was carved the figure of a lamb’. It took a while for the last line to click but eventually I remembered reading about a carved stone in the report of the excavation of the old church in 1973 by Dorothy and Jim Gould of the South Staffordshire Archaeolgical and History Society. A note by Mr J W Whiston, appended to the SAHS report says that there is no reference to the carving in any published description of the church, but that, ‘although mutilated, the carving can be identified as the arms originally granted to the Merchant Taylors Company of London before, in the time of Elizabeth I, the chief of augmentation was added (a lion passant and guardanty). These arms were frequently used by provincial merchant-taylors’. It also mentions that there is a similar carving on the porch of St Michaels in Lichfield. When I checked back on my photos of St Michaels from last spring, I found it (which saved me a trip). Funny how you see things that you don’t realise the significance of at the time, but fit into the big jigsaw eventually. Not knowing anything about the Merchant Taylors’ Company I looked them up and found that their patron saint is St John the Baptist. As you can see from the above (sort of), their coat of arms features a pavilion with a mantle either side, with the Holy Lamb within a sun. Perhaps this is the lamb to which Mr Foulkes was referring? You can read more about the company here. 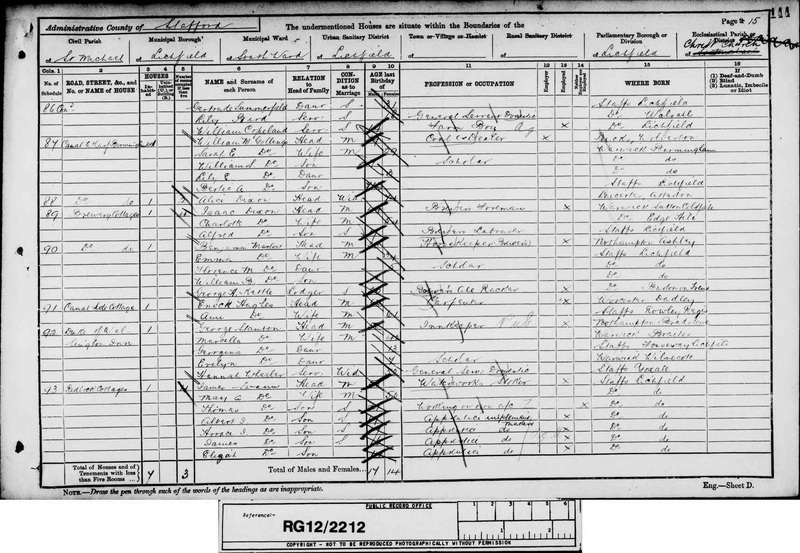 Bottom right hand side of door – is this the carved stone? Should have taken a closer look. According to William Whites Directory of Staffordshire (1834), the annual feast or wake at Shenstone was held on the Sunday after St John the Baptist’s day. Something that’s not mentioned in the archaeology report, or the newspaper report as far as I can see, is the existence of a holy well somewhere in the churchyard. 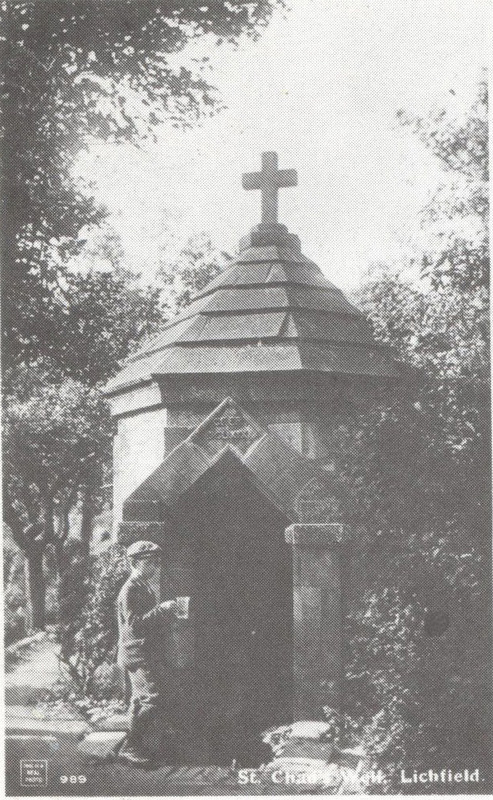 On the saint’s day (or Midsummer if you prefer), St John’s Well was believed to be a place of healing and of miracles. I can’t see it on any of the old ordnance survey maps but I am hoping it’s still gurgling away and hasn’t dried up. On the subject of St John and Midsummer, I know I probably shouldn’t speculate about the place name Shenstone – bright/beautiful/shining stone or rocky place – but the idea of the sun and bonfires associated with the festivities of St John’s Eve and Midsummer has popped into my head and now I can’t get rid of it. Feel free to shoot me down in flames. I’ll try and distract myself with another example of pieces of the jigsaw fitting together eventually. 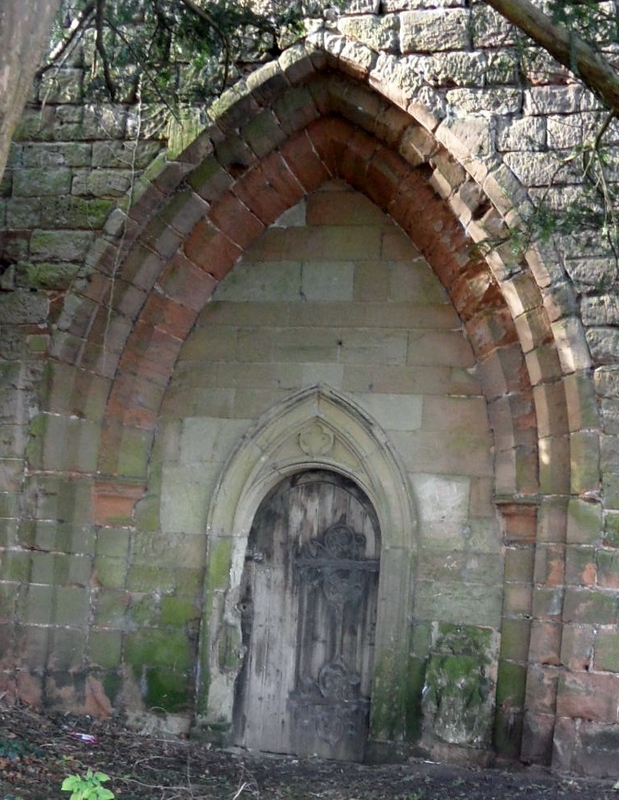 In an account of ‘ Ancient Shenstone’ by Madge Rogers in the Lichfield Mercury in the late 1940s that I was reading, she mentions, ‘A Peat Moor once stretched highly polished stone was erected in the churchyard, and was the tomb of 25 year old Richard Burgess of Leicester who journey by stage coach to the Welsh Harp in Stonnall and there took his own life’. I don’t really understand the bit about Peat Moor but the story of Richard Burgess sounded familiar. I remembered that a while ago, when trawling the newspaper archive for something to do with pubs, I had read a story from the Derby Mercury, June 1754, about a young Gentleman who was travelling with the Chester Stage Coach, on his way to Ireland to be married. Apparently, en-route he had received a letter from his fiancee’s Father, telling him not to pursue his journey, as she would not marry him. When the stage coach stopped off at Noon at the Welsh Harp near Lichfield, the young man took his own life. Surely this must be the same tragic young man? To think up until recently the only place I’d ever visited in Shenstone was the Tesco Express. What a fascinating place it is, and I haven’t even started to read about the prehistoric and Roman connections yet. I pass by the Clock Tower at the Friary several times a week and in the stillness of the night, I can hear it chime, slightly out of synch with the Christ Church clock. According to Annette Rubery‘s wonderful new book, Lichfield Now and Then, the tower was built in 1863 to mark the 300th anniversary of the Conduit Lands Trust. When the new Friary Rd was built, the tower was moved to its present location. The Wikipedia entry here has some photos of it in its original site at the junction of Bird St and Bore St. The Staffordshire Past Track has some great photos of the tower being dismantled, including one of the bells being lowered down (is this one of those I can hear?). At Lichfield is a structure The Crucifix Conduit. It has been rebuilt within the last few years and now there is a plain cross on the top. Did the original have a crucifix? Was the crucifix, if any, destroyed in Puritan times? Is there any drawing of the building in existence And if so where can see it? The old conduit at the Friary gate does not appear have been surmounted with a crucifix but was so called from Crucifix being the name of the locality on which stood. Gregorius Stoneing receiver of the rents of possessions of the Fryars Minors of Lichfield after dissolution thereof in his account in the court of Augmentation answered, and so was charged with, and the rent of a certain water course within the compass circuit of the late house of Fryars aforesaid running from Poolefurlonge to Lichfield street, viz to a certain called the Crucifix demised to John Weston at the will of the Lord. (Shaw’s Staffordshire 1820) A engraving of the old crucifix conduit will be found A Short Account of the Ancient and Modern State Lichfield 1819′. A quick search on the invaluable googlebooks finds that book, and as promised, a drawing of the crucifix as it looked in 1819. 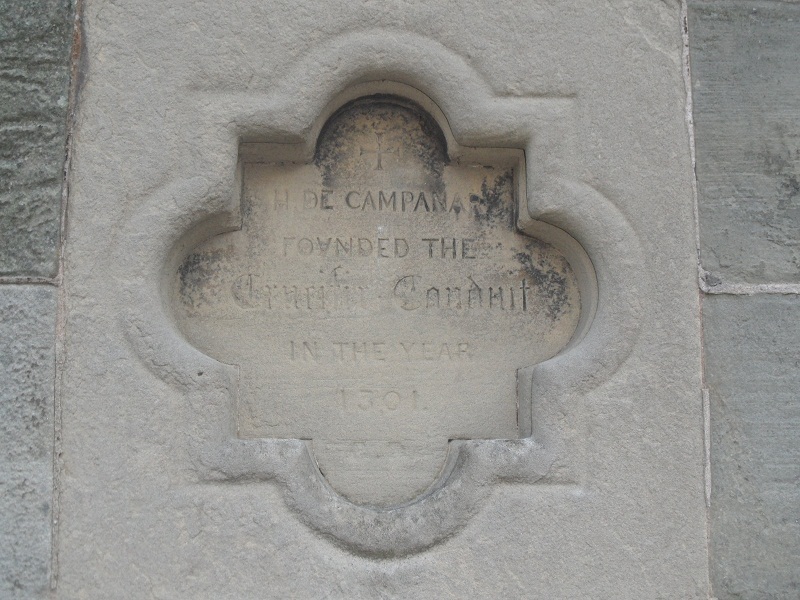 I had thought that the Crucifix conduit was no longer in use by the time the clock tower was built – the listed building description says it was built over the ‘redundant conduit’. However, different accounts suggest that the conduit was still used as a public water supply beyond this date. The County History says ‘In 1863 it (the Crucifix Conduit) was adapted as the base of a clock tower designed in a Romanesque style by Joseph Potter the younger, but the conduit continued in use’.This probably explains why what look like drinking fountains can be seen built into this section of the tower! I find this next bit confusing and am happy to be corrected! What I understand is that the water came from a spring at Aldershaw. In 1301, Henry Bellfounder granted the Fransican monks the right to built a conduit head over the spring, and to pipe the water to the Friary. He apparently did this for motives of charity and for the sake of his and his ancestors’ souls’ health. Although it seems the water was supposed to be for the friars’ use only, a public conduit was built outside the Friary gates. When the Friary was dissolved in the mid-16th century, I understand that the Conduit Lands Trust took over the responsibility for maintaining the water supply to Lichfield when the spring at Aldershaw was granted to the ‘Burgesses, Citizens and Commonalty’ of the City of Lichfield. 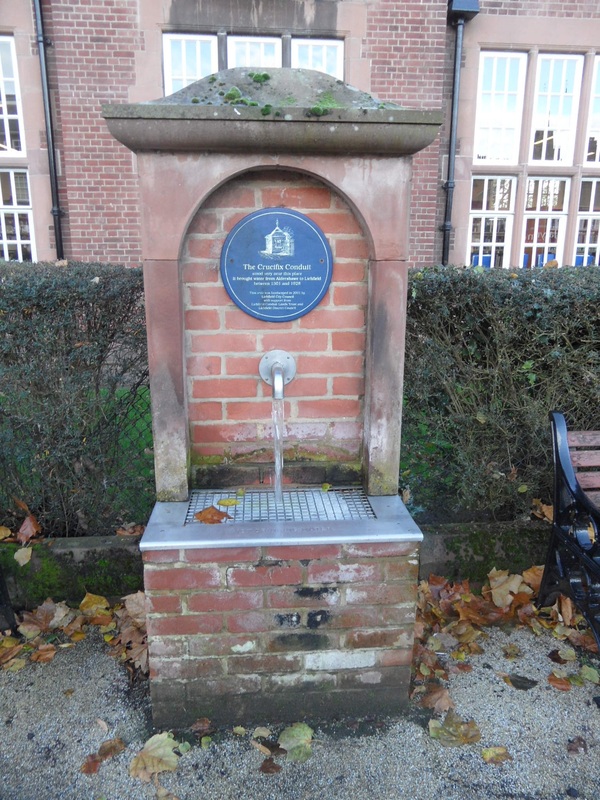 A fountain marks the approximate site of the original public conduit (and of course the later clock tower) near to the library and record office. Although the water is no longer suitable for drinking, it serves as a symbolic reminder of the water supply that was once available here. 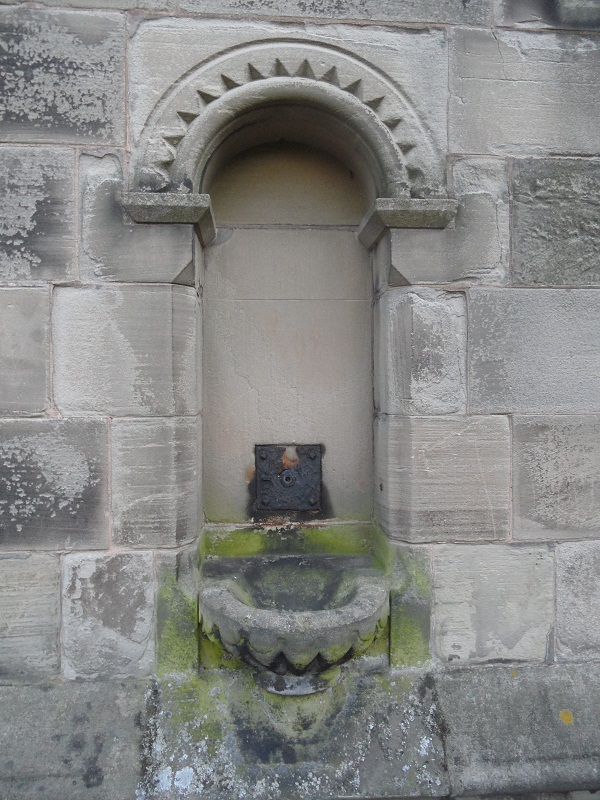 A stone conduit head dating back to 1811 can apparently still be found over the spring at Aldershaw. 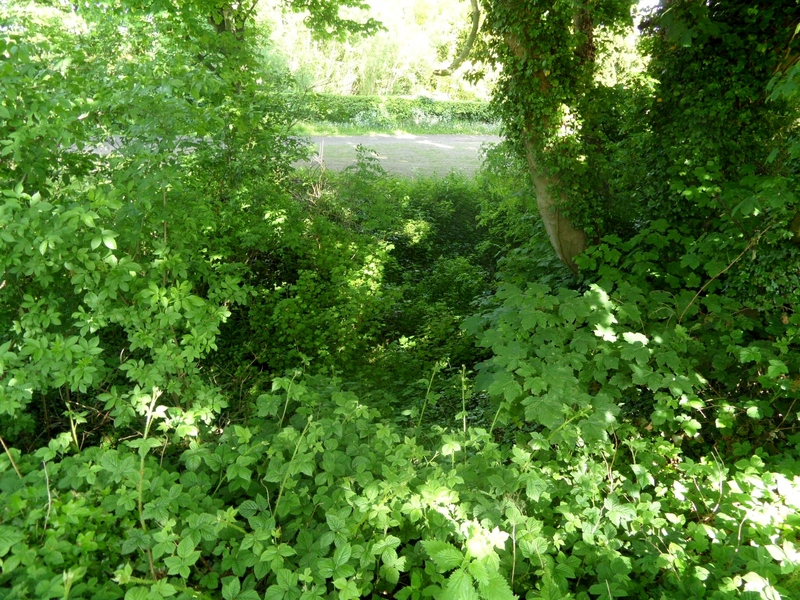 The spring was known as Foulwell which may not sound like the most appealing place to get water from, but as BrownhillsBob explained to me that the name ‘foul’ is most likely to mean ‘obstructed’ in this context. What’s also interesting is that the well seems to have an alternative name – Donniwell, which crops up in some transcriptions of old documents (dating back to the 4th year of the reign of Edward VI which would be 1551. I think.) that Thomas Harwood made in 1806. Funnily enough, searching to find an interpretation of the name lead me back to another edition of ‘Notes and Queries’, (this earlier issue from 1855 was described as a ‘Medium of Inter-Communication between for Literary Men AND Artists, Antiquaries, Genealogists etc). Someone else had questioned the meaning of Donniwell in relation to the spring near Lichdfield, and received the following answer from WLN of Bath. The word Donni or Donny in Donniwell is merely the old Keltic (sic) vocable don (otherwise on or an), water, with the diminutive y, and signifies the little stream or brook The word is still retained in the name of the rivers Don in Yorkshire, the Don which falls into the sea at Aberdeen, another Don in county Antrim Ireland, and in the Don in Russia. Hence, too, the Keltic name for the Danube, Donau, latinised Danubius. There is also Donnyland in Essex and the two rivers Oney in Salop and Herts, Honiton or Onyton in Devon and the Uny in Cornwall are all different forms of the same root. So there’s one idea…..anyone have any other ideas of where this name may have derived from? Coincidentally yet appropriately, today is the 8th December, the Feast of the Conception of St. Mary, the date on which two wardens were appointed each year to keep the conduits and watercourses of Lichfield’s water supply in repair. 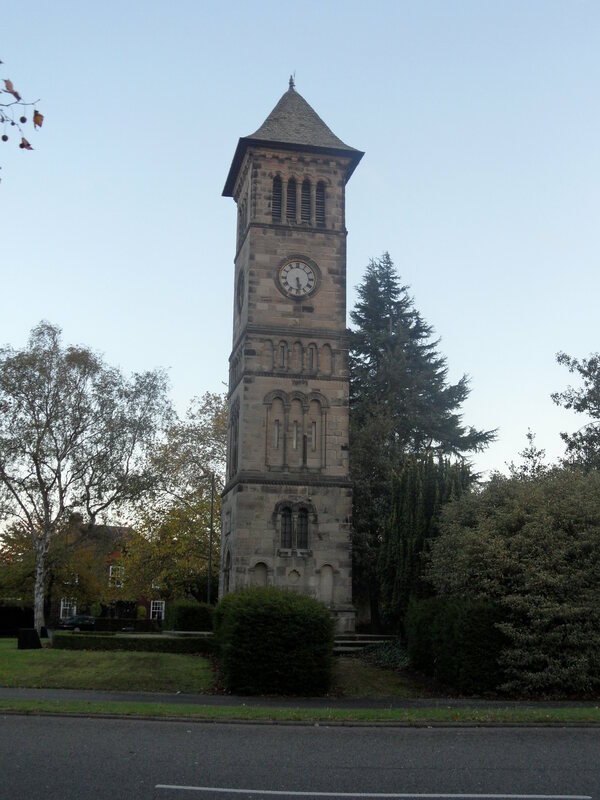 I also like the idea that the chiming bells of the Clock Tower provide an appropriate, yet coincidental link to the name and occupation of the man who originally gave the spring at Aldershaw which fed the conduit (at least I think its coincidental….). I also find it interesting that back in the mid 19th century people were asking similar questions to the ones that I’m asking today. It seems it’s not just me that is fascinated by the idea of springs, wells, conduits and water in general! Now I know a little more about where the water came from, and where it went to, I’d like to know more the inbetween part i.e. the actual route of the water. That also goes for the conduit between Pipe Hill and the Cathedral Close too. As it looks unlikely that I’ll be able to go looking for the conduit head at Aldershaw (it’s on private property) as I did with the one at at Pipe Hill, I shall have to concentrate instead on tracking down the archaeology reports and journals that reveal more about our medieval conduits, at Lichfield Record Office. 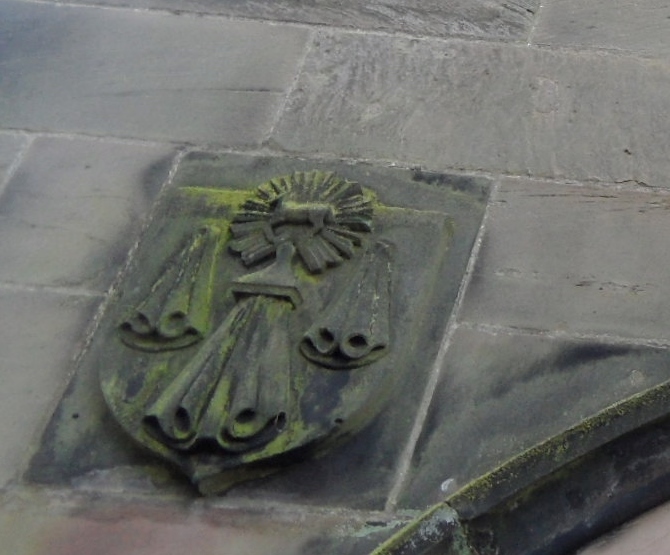 Also, for more about the Friary, Gareth Thomas has added some original deeds and plans to his blog All About Lichfield. *This date is a little strange as the Clock Tower was built in 1863. Perhaps the letter was written before this time and not published until 1865. I’ve just been reading part of The History of the South Staffordshire Water Works Company. This suggests that a public water conduit of some description, pre-dates the granting of the spring at Aldershaw to the Friars. Apparently, there was a public conduit in the early 13thc, and there are also references in the Cathedral records to a Conduit St, and a conduit in the high street. Are these are connected to the Crucifix conduit or separate? And where did this water come from? The document also gives some really interesting information on the pipes themselves. It says that originally wooden pipes were used (bored tree trunks). It refers to a document from 1707, that says the pipes ‘being made of alder had become rotten, leaky and in decay and accordingly taken up and replaced by leaden pipes’. Interesting that the pipes were made of Alder, and the water came from Aldershaw. It also says that in 1801, the Conduit Lands Trust replaced a small gauge lead conduit from Aldershaw with a larger diameter cast iron main, which enabled a greater volume of water to be carried to the City. It also gives this interesting information on what happened when supply started to exceed demand. By 1821, Aldershaw was proving to be inadequate source and a scheme was devised to supplement the spring’s supply, by collecting the surface water from Tunstalls Pool, the Moggs and other pools and diverting water into the common conduits. When the situation worsened in the mid 1850’s, the trustees acquired the Trunkfield Mill and Reservoir and a pumping engine was installed to increase the supply. 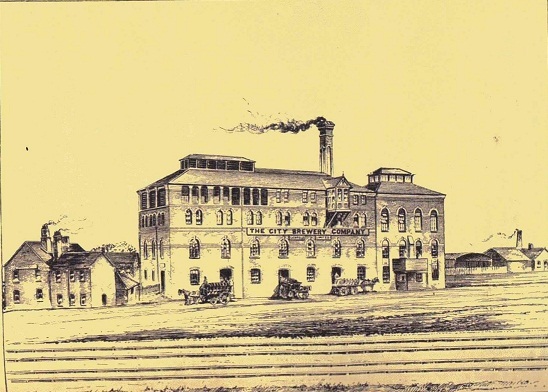 In 1868 the supply of Aldershaw yielded 15,000 gallons a day. Trunkfield supplied 160,000 gallons a day, all of which was pumped to Crucifix Conduit. Water was provided to fifty seven public pumps, thirteen standpipes and public taps, thirty fire hydrants and three hundred and forty three houses. The document isn’t too specific about their sources, so having to take what they say on face value for now. Lots more reading to do I think….Luckily for me, local historian Clive Roberts is going to send me some information he has on the Conduit Lands Trust!